Up until last year, we had an average of approximately 98% white shark sightings on our trips over the course of the year. However, roughly a year ago, two orcas started to intermittently visit the bay and began predating on the white sharks, which caused the sharks to flee from the area after the predation attacks. Each time they began to come back after a few weeks (2 to 6), only to be attacked again and disappear. We lost 5 great whites to orcas over a period of 6 months – a huge and tragic blow to our already threatened population. A study carried out over five years and published in 2016 revealed that there are most likely only between 350 and 522 great whites left along the South African coastline – which means that over the last year we have lost 1% of our population or more. The orcas have been absent for a couple of months now and, based on several recent sightings, the great whites seem to be making their way slowly back into the bay. Apart from the appearance and prolonged stay of the orcas, another strange phenomenon is that in the absence of the white sharks, a population of copper sharks (also known as bronze whaler sharks) has taken up residence in the bay. This is particularly odd in light of the fact that this is usually a migratory species. But I’ll get back to the ‘bronzies’ in another blog – let’s keep the focus on orcas for now. Here are some fast facts about these formidable animals. Orcas are apex predators, meaning they head up the food chain and are essential to keeping the health of our oceans in balance. Officially called Orcinus orca, these creatures are also known colloquially as ‘killer whales’ – however, they are in fact not part of the whale family but the largest of the dolphin species. The orca is the only natural predator of the great white shark. The species is data deficient (DD), which means that not enough research has been done on them to classify their conservation status according to the standards of the International Union for Conservation of Nature. Orcas have an enormously widespread distribution, occurring in oceans across the globe from the south to the north poles. On rare occasions, they have also been spotted in estuaries and rivers, including the Thames, Rhine and Columbia rivers. The life expectancy of an orca in the wild is typically 30 to 80 years, 50 on average. 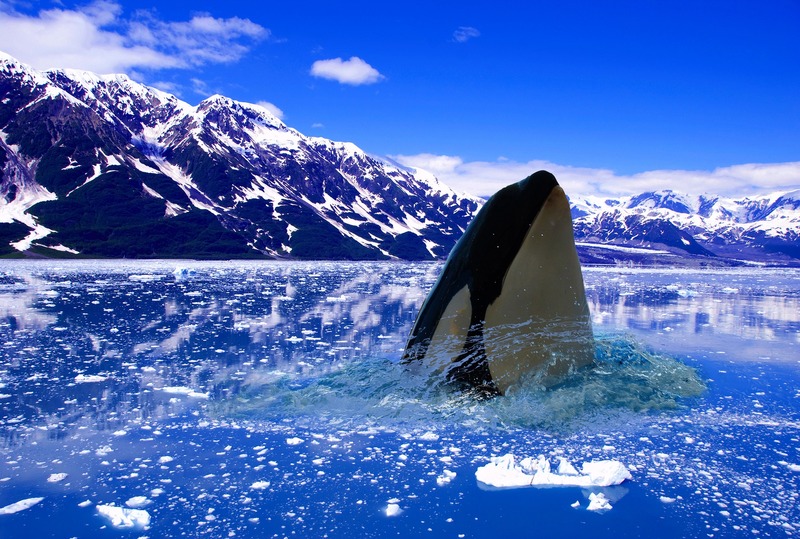 Orcas are one of only a few species on the planet other than humans in which females go through menopause. As most orcas remain together in family groups, it makes sense for older females to stop breeding in order to retain genetic diversity as they become increasingly related to members of the pod. These massive mammals weigh on average 4 to 6 tons (females) and 7 to 10 tons (males). The largest orca ever recorded weighed 11 tons. Orcas travel in family sets known as pods, which can include up to four generations of a family. Pods are generally made up of between 5 and 30 individuals but sometimes move in larger clans or communities that can be as large as 100-strong, while the smallest pods can include as few as 2 individuals, such as the pair of orcas sighted in our local waters. Each pod belongs to a wider familial clan and communicates in a unique ‘accent’ or ‘dialect’ of the same ‘language’, using a combination of sounds that include whistles, clicks, pops and pulsed calls. However, different orca clans use completely distinct sets of sounds, in the same way that humans from diverse nationalities or ethnicities generally speak in different languages. When different clans of orcas move together, they are known as a community. 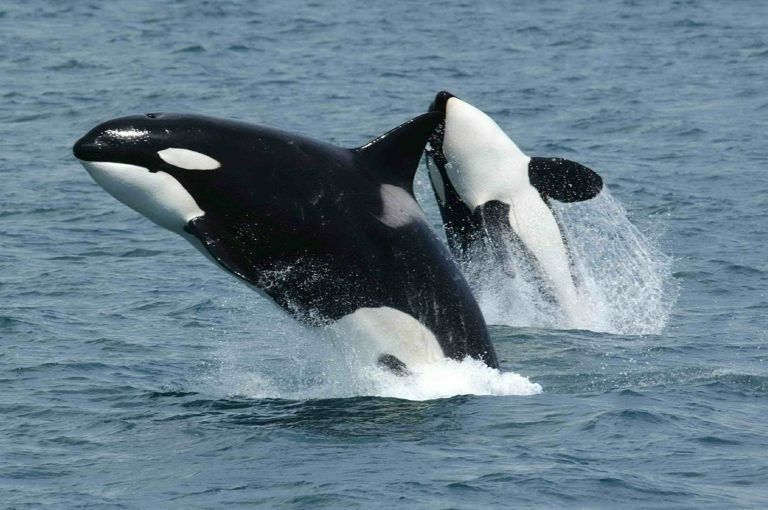 Orca pods can be either resident or migratory and different pods favour particular prey, from seals, squid and birds, to dolphins, skates and sharks. Most male orcas remain with their mothers throughout their lives. Despite being the ocean’s top predator, orcas have never been known to attack a human in the wild. The same cannot be said for those in captivity – captive orcas have killed a string of trainers and handlers, a phenomenon that most researchers ascribe to stress.